To make it easier to move around and use the website, we've decided to standardise the navigation menus at the top of each page, and also move some of the non-navigation features away from the menus. Create menu - This is a new menu which gives you instant access to all the different ways of creating a route. Tutorials menu - You now have access to the video tutorials from virtually every page on the site. 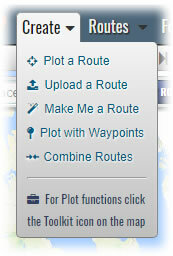 Plotting and Editing Functions - These are now accessed by clicking on the Toolkit icon on the route planner map. Find a Route - To search for routes on the map, you now need to select "Find a Route" from the Routes menu. You can then filter your results as before by clicking a new Filter button above the search results. Universal Search box - This has now been added to the route planner, enabling you to bring up a known route from this page without having to move to another page. Search for a Place - The search box for locating the route planner map has been moved to the top left corner of the map. As part of these changes, we've also updated all the relevant Tutorial videos.